Gaining the trust of a potential customer and then converting them to a repeat buyer takes a clear understanding of the buyer’s journey (often also referred to as the customer’s journey). It means taking a step back from the way you view your product or service and viewing things from your customer’s point-of-view. But, the process doesn’t stop there. 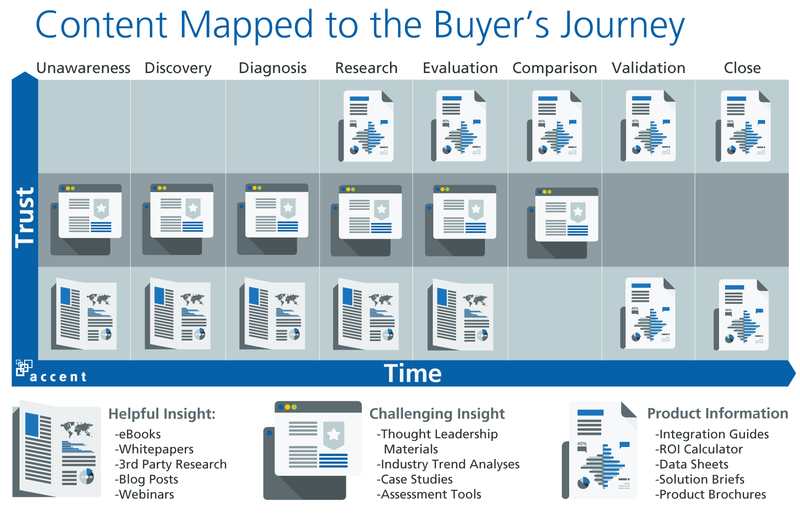 After you’ve mapped out the customer’s journey, you must also provide your potential buyer with the proper content to push them to the next stage of the sales cycle. The customer journey refers to the path followed by a customer, including all touchpoints before making a purchase. 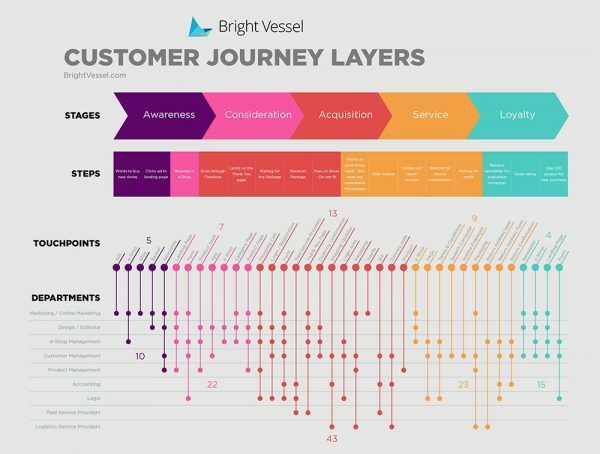 Mapping out a customer journey requires a change in the way you view your product or service. You need to think through the journey your customers take to become a customer so you can identify points of resistance to deliver content that will remove any friction that might stand in the way of the sale. 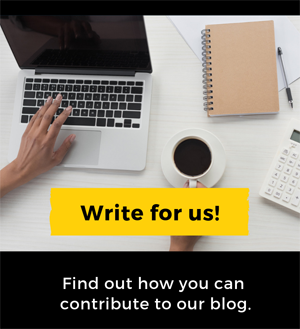 In this infographic from Temkin Group’s Customer Experience Matters blog, you’ll see the five questions one must ask when building out the customer journey map. What did the customer do right before? What will the customer do right afterward? Check out this video on the power of customer journey mapping. 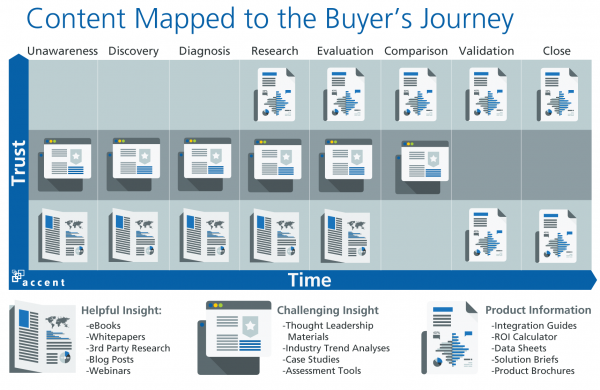 Using a customer journey map can help you define and refine your customer’s experience. In this demo below developed by Bright Vessel, you can see the stages, steps, touchpoints, and departments. You can see how mapping out this scenario would differ from mapping out a customer who keeps their order and loves their shoes. There are many different touchpoints that you should include. It’s not just the marketing and sales departments that are involved in the customer journey. Now that you’ve mapped out the journey your customer goes on, it’s time to build out a content plan. 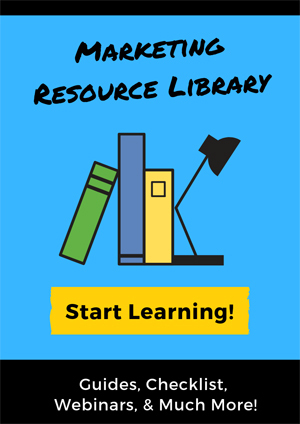 Check out these two resources for deciding what type of content to provide your potential customer depending on where they are in the sales cycle. The map above was developed by Accent Technologies. 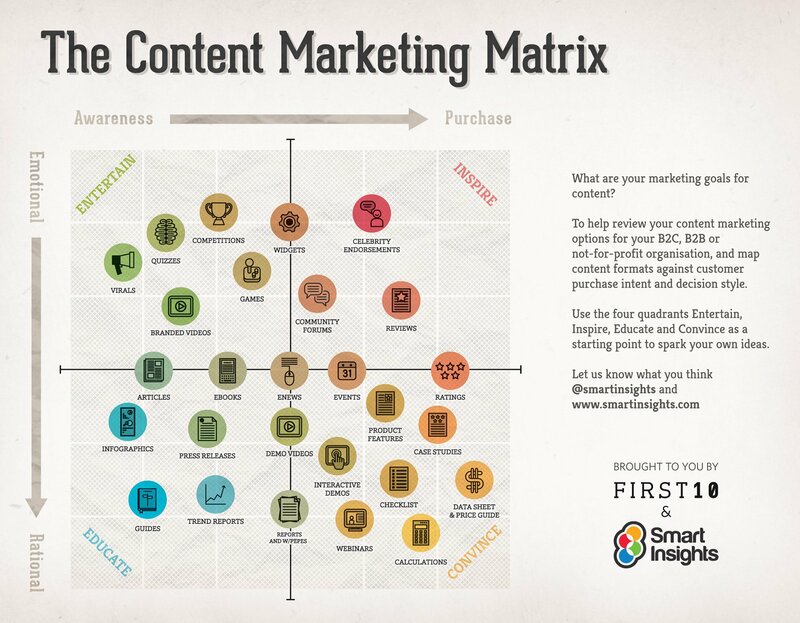 Another helpful resource developed by First 10 & Smart Insights is The Content Marketing Matrix. 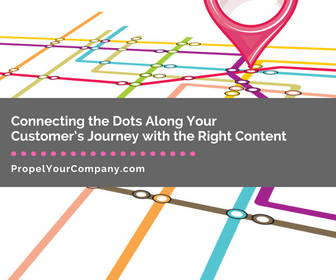 Now it’s your turn to start mapping out your customer’s journey and creating content to help convert them into repeat customers. 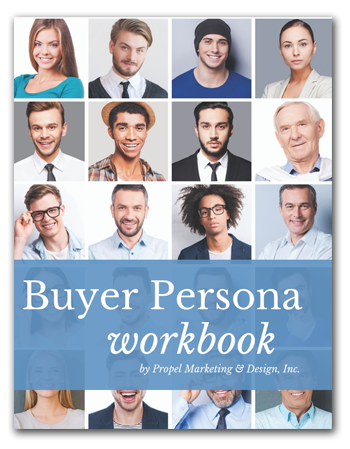 Download your FREE Buyer Persona Workbook!